It’s the year of 2 time, 2 time ,2 time inductees! 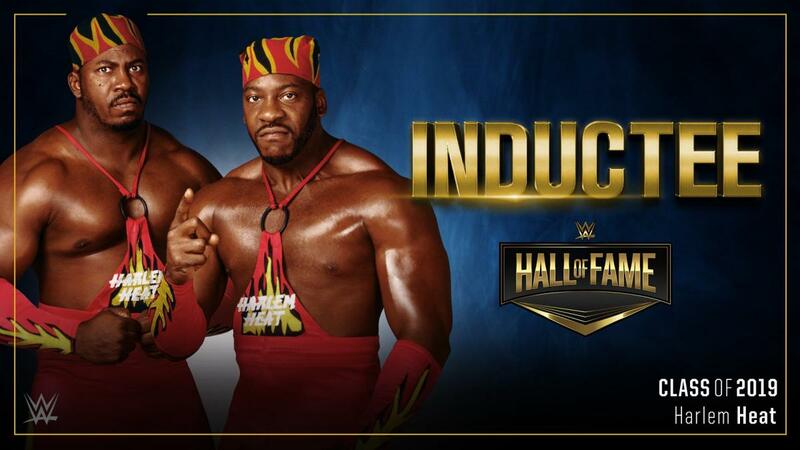 (See what I did there) Harlem Heat, Booker T (aforementioned previous inductee) and Stevie Ray are joining the WWE Hall of Fame Class of 2019. While I am sure we will see future two time inductees which are less than stellar, Booker T and his brother are a very well deserving tag team inclusion. The only real “surprise” is that Harlem Heat, and Stevie Ray himself never competed for the WWE and are very rarely if ever mentioned. This strikes me similar to the Rock n Roll Express in 2017, a deserving Tag Team outside of the WWE banner. Well deserved induction. My only quibble is yet again Demolition, Hart Foundation and the British Bulldogs are not going to be included. This is a running theme. Anywho, I will do a full breakdown of Harlem Heat soon. In meantime, here’s some title wins for the HEAT! Booker T’s inclusion makes a statement. He is the latest (and most likely last) inductee into the 2013 Class, making it without a weak link. It is super strong. Booker himself is an obvious candidate. He is a rarity in the history of professional wrestling. 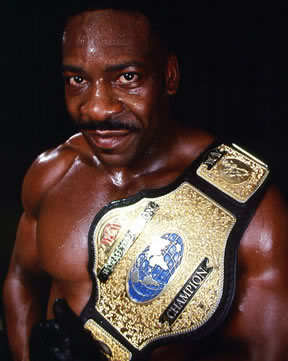 He is one of only a handful of African American wrestlers. He also survived and flourished in the very varied atmospheres of WCW and WWE. But where is Booker’s lastly legacy? WCW produced and showcased many great talents. Their money alone allowed for the best luchador, Japanese, Cruiserweights and Tag Teams. Booker began his tenure with Harlem Heat (with brother Stevie Ray) They were one of the last successful long term tag teams. Their chemistry and longevity was Legion of Doom worthy. Booker T’s WCW run can be sumarized in title reigns. He held bunches and bunches of titles. It says a lot about a talent who keeps getting handed gold. Its a faith in their abilities. Shelton Benjamin and Kofi Kingston are two modern examples of that type. But Booker did something which perhaps seemed impossible, he won the big one. WCW in late 1999 and early 2000 attempted to rebrand. As Bischoff, Russo and others traded control, the “younger” market was targeted. Booker T was given a run during the peak of Jeff Jarrett’s many title reigns. And he ended up holding it again and again throughout 2000 and 2001. Booker T was even the last WCW Champion on the last WCW Nitro. Booker’s title reigns matter. He is one of only a handful African American World Champions. He was WCW’s 2nd (after Ron Simmons) and he flourished in that roll. Booker T became one of only a dozen men or so to be made main eventers by WCW. And then the WWE happened. Booker T decided to join the organization immediately after the acquisition. (Most likely why he was given the belt over not joining Scott Steiner) and proceeded to slowly flop. Booker T wasn’t really given a chance. He was a WCW guy and was treated as such. Sting explains well the perception of Booker T’s entrance here. He also had THAT terrible match against Buff Bagwell. In 2001 Booker T went from main eventer and World Champion to afterthought. He lost all the time. Even in his high profile matches (against Austin or Rock) it was obvious that according to WWE, Booker wasn’t as good as the home grown. He then was buried. His match at Wrestlemania in 2002 was over a fictional Japanese toothpaste commercial. The point is Booker T should never have succeeded in WWE. The WWE didn’t make it easy for ex-WCW stars. They were treated differently, never really pushed and made to see that the WWE was in charge of them. Most didn’t succeed (DDP, Scott Steiner, Kevin Nash, Goldberg, etc) but that few that were able to take the licks, were eventually rewarded. Eddie Guerrero, Chris Benoit, Rey Mysterio and Booker T were all successful. Because they wanted to be and didn’t have an ego about it. That is the essense of Booker T’s greatness, he succeeded in two organizations were the chips were against him. His race, and the switch of organizations would have kept down many people but didn’t Booker T.
Now I will say this. Booker T has been part of some of the worst or silliest angles in WWE’s 2000s. He fought and lost to Boogeyman, the aformentioned fight over being in a Japanese commerical and most tragically his loss to Triple H at Wrestlemania 19. The angle was kinda racist. And the face Booker T didn’t get his revenge and lost cleanly to the heel. Booker T still had his good moments. He won the IC, US and World Heavyweight Titles and by his depature in 2007 had regained his nominal credibility. He bowed out (due to a wellness violation) and eventually reappeared in TNA. Booker is one of the few talents who have left WWE, went to TNA and come back. Superstars like Gail Kim, Jeff Hardy and Chrisitan have all attempted and succeeded to one level or another. But Booker was different. His returning was a homecoming. He didn’t come to be a regular wrestler. He came to be with his wrestling family. And although he is constantly messing up at any or all talking job he has, Booker is beloved. Check out the Awesome Bookamania below. Booker’s inclusion this year has multiple reasons and also multiple concerns. The logic is solid. 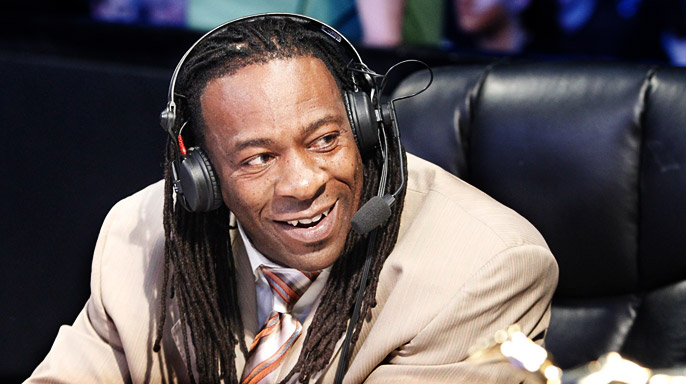 Booker T is a former WCW star, not a active wrestler and reaching his 50s. He is older than Sold Cold when he went in. He is also African American, which WWE likes to include one inductee who is not white in each Hall of Fame Class. That aside Booker T also does something to this Hall of Fame Class. He makes it the first in history to have no weak links. Even 2005 had Bob Orton ( reverse nepotism) Every inductee in the 2013 is a former World Champion or Donald Trump. That alone is impressive and makes me okay with his induction. It also sends out the message that the Hall of Fame is serious again. 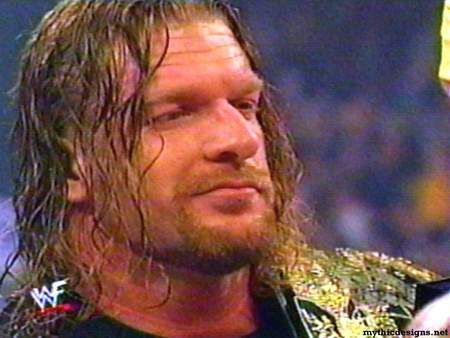 Good job Triple H.
His youth or perhaps saving him for the Mick Foley position in another class.